Designed by renowned golf course architect Graham Cooke, Willow Valley equally challenges any level of golfer. Each hole here at Willow Valley was carefully crafted to challenge your game and yet offer maximum enjoyment. With our five par fives, eight par fours and five par threes, the course combines a beautiful yet challenging mixture of varying tee elevations, numerous fairway and green-side bunkers along with tiered greens. A must play for all golfers alike. 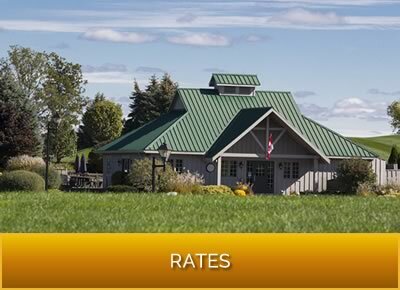 Located 10-minutes south of downtown Hamilton, near the village of Mount Hope, Willow Valley Golf Course lies in the centre of the Golden Horseshoe, nestled in a stunning natural landscape adjacent to the Niagara Escarpment. Situated midway between Toronto, ON and Buffalo, NY, you will find us conveniently accessible, whether you’re from the GTA, Burlington, Mississauga, Guelph, St. Catharines, Hamilton or anywhere in between! At Willow Valley, we pride ourselves on maintaining the highest quality turf among Hamilton area golf courses. With a background in sod farming, we have keen insight into the technology and strategy needed to maintain an impeccably manicured playing surface. Our Hamilton golf course provides a comprehensive golfing experience. We offer avid golfers a range of leagues and programmes throughout the season, and have top quality event facilities to host your wedding, anniversary or shower. At Willow Valley, you will also find one of the best bent grass practice facilities among Hamilton golf courses. Sprawling over six acres, it’s the perfect spot to warm up before your round or to fine-tune those approach shots. It’s a must play course for all golfers! Book your tee-time at Willow Valley today using our online reservation system or by calling 1-877-651-7041. Internationally renowned golf course architect Graham Cook and Darrell Huxham started shaping the course in 1998. The last fairway seed was put in the ground in September 1999 and the course opened in June 2000. Since then, we’re proud to have been many area golfers’ top choice amongst Hamilton golf courses. And we aim to continue offering you a premium golfing experience, with a constantly developing course built to maximize your enjoyment. Modern design ideas were used to highlight the natural beauty of the surrounding Niagara Escarpment and to enhance the playing experience with challenging risk-and-reward concepts on this unique course. Our course features four sets of elevated bent-grass tee decks, sweeping well-defined bent-grass fairways, gently rolling bluegrass, fescue roughs, and 70 bunkers of pure white Ohio sand. We have also established environmental areas to preserve wildlife habitats and promote natural flora. Our landscaping and gardens have also earned us several City of Hamilton Trillium Awards. With our five par fives, eight par fours and five par threes, the course combines a beautiful yet challenging mixture of varying tee elevations, numerous fairway and greenside bunkers, along with tiered greens. We offer tee selections from 5,200 to 6,522 yards to cater to golfers of all skill levels. Willow Valley is the ideal setting for the recreational golfer, rounds with the family, and even business meetings. Sometimes, spending hours on the putting green, tinkering with your short game, is the best way to spend a summer afternoon. Open daily from dawn until dusk (except on Sundays and Wednesdays), Willow Valley’s practice facilities provide superior training opportunities, helping place us among the best golf courses in Hamilton and the surrounding area. It’s an expansive space to get familiar with specific aspects of your game. Whether you’re warming up before your round or spending time improving a certain part of your game, come to Willow Valley and practice your swing on the real thing. We feature magnificently manicured bent-grass tee decks and a variety of target greens, a chipping area and a magnificent practice putting green. We are noted among Hamilton area golf courses for our high-quality turf and surrounding natural beauty. Avid and recreational golfers return to Willow Valley again and again over other Hamilton golf courses for our excellent value. Rates for a regular round start at $57. We also offer special rates for senior and junior golfers, as well as those who only have time for 9-holes. If you aren’t picky about your golf tee times, we also offer special rates for twilight golfers. If you’re a frequent golfer, we also offer 10—20% savings with our Advantage Packages. These tickets are valid for two years, fully transferrable, and you can split them between friends and families. It’s a great way to get more golf and save! At Willow Valley, you will find a professional, country club feeling without the exorbitant price tag. 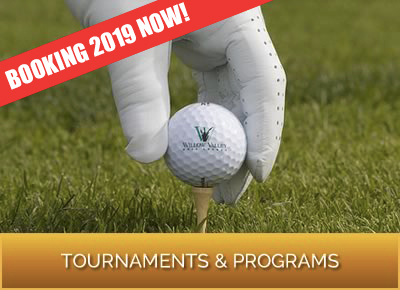 At Willow Valley, we want you to get the most out of our finely crafted golf course and the golfing season in Canada by joining our weekly Men’s Leagues and Women’s Leagues. Your membership entitles you to weekly play, use of a shared power cart, and dinner. Members are also eligible to win one 18-hole weekday pass at Willow Valley and a 15% discount on Pro Shop merchandise. Willow Valley Golf Course welcomes groups of all sizes. We can accommodate intimate events and even full-field events for up to 144 golfers. Plan to have your next corporate or fundraising event at Willow Valley, a premiere Hamilton golf course! Whatever your tournament format, you can rest easy in our hands. We have experience organizing a variety of different tournament formats designed to suit your start/finish time needs. We offer your group the ability to create event-specific signage, a specialized registration area, driving range privileges prior to the tournament, shared power carts with customized name plates, and complimentary ice-cold bottled water. We also offer bag-drop services. We appreciate that the guests you’ve invited to your event are important and we promise to treat them with the utmost care. We understand that you want your golf tournament in Hamilton to be unique and memorable. We can create on-course contests or a specialty hole. We can tabulate all scorecards according to the format you selected for your tournament, and offer a clubhouse reception with a 15 % discount on all prizes purchased from the Pro Shop. Make your tournament extra special with added touches, including a bagpiper; beverage and/or meal tickets; customized logo balls for as low as $22 per dozen; photographer services; access to a projector and screen; proximity markers; a putting board; access to rental clubs (King Cobra brand); trophies, plaques and/or other awards; and Willow Valley bag tags with player names, or whatever customized greeting you wish. Our knowledgeable on-site tournament coordinators can outline all of the course’s services and help you build and execute a memorable event! Nestled in the natural beauty of the Niagara Escarpment and the manicured emerald green lawns of our expertly designed 18-hole golf course, our banquet marquee can accommodate up to 175 guests. Willow Valley Golf Course is the ideal setting for your next anniversary, engagement, wedding reception, fundraiser, or family reunion. We are distinguished amongst golf courses in Hamilton for our knowledge and commitment to customer service. Clients are charmed that Willow Valley golf course is located beside the quaint village of Mount Hope. Minutes from the 403, it’s only a short trip from Toronto or Oakville. Our dedication to maintaining quality facilities, and offering exceptional service, has attracted guests from as far away as Edmonton, Ottawa, North Bay, and the United States. Our golf course manager would be delighted to schedule an on-sight visit and discuss the needs of your next event. Call, Carrie Kennedy at 905-679-2703. Willow Valley is centrally located next to the village of Mount Hope in Hamilton. We are only a 10-minute drive from downtown Hamilton and 50-minutes from Toronto and Niagara Falls. We are also conveniently accessible for golfers in Burlington, Mississauga, Guelph, Cambridge and Waterloo. Since first welcoming golfers onto our links in the summer of 2000, we’ve distinguished ourselves from the field of Hamilton golf courses in playability, excellent turf and golf course design, customer service, as well as affordability. Golfers choose Willow Valley time and time again for the outstanding overall experience. We promise you a great day out on the links! Let our friendly pro shop staff help you find everything you need to improve your game or a special gift for the golf lover in your life. We offer high quality name brands, including Titleist, Greg Norman, King Cobra and Pinnacle. Our pro shop can be reached by calling, 905-679-2703. Guests are welcome to book a golf tee-time using our online reservation system up to 14 days in advance or up to 10 days in advance by calling our pro shop at (905) 679-2703 or toll free at 1-877-651-7041. When booking your golf tee-time you will need to provide us with your full name, contact phone number and a valid credit card number to secure your reservation. We require a notice of cancellation 24-hours before your tee-time. If you book four players and arrive with three, we will charge for the fourth and issue a rain check. If you make a reservation and fail to show up without cancelling, we charge your credit card for all four players and issue a rain check. We allow soft spikes, spikeless or soft-soled athletic shoes. Ladies, please refrain from wearing tank tops. We allow sleeveless shirts for women golfers as long as they have a collar. All rain checks have a 30-day expiration date. If you play less than seven holes, you will receive an 18-hole rain check. If you play seven to 14 holes, you will receive a nine-hole rain check. The Willow Valley Golf Course allows for a four hour and 35-minute pace of play to be maintained over the course of a full round of golf. To ensure an enjoyable day for all, we encourage guests to be mindful of the etiquette, traditions and basic rules associated with the game of golf. We strongly encourage all of our guests to do their best in repairing ball marks, replacing divots and raking the traps while playing on Hamilton golf course.